My first HALO comics story is in October's TALES FROM SLIPSPACE! Continuing my string of weekends where news of my new projects breaks, I am pleased to announce my return to Dark Horse Comics with my first story set in the Halo universe! 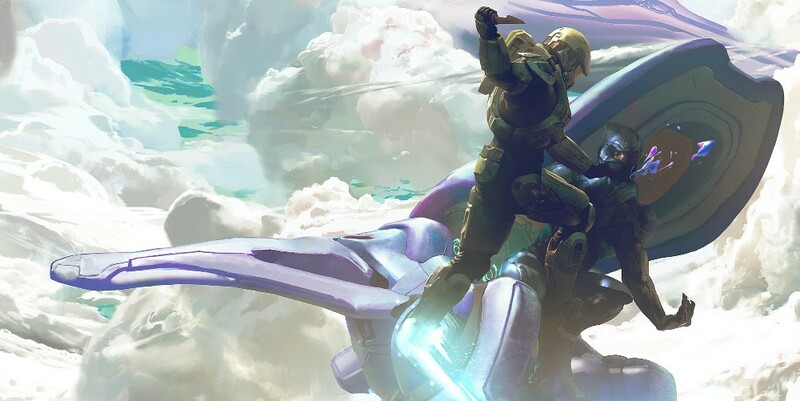 "343 Industries and Dark Horse Comics are set to release a brand-new Halo® graphic novel anthology based on the massive video game franchise later this year. Halo: Tales from Slipspace will feature all-new stories from some of the comic industry’s best — including Jonathan Wayshak, Eric Nguyen, Alex Irvine, Kody Chamberlain, Dave Crosland, John Jackson Miller, Jonathan Goff, Simon Roy, and Halo: Escalation writer Duffy Boudreau — as well as 343 Industries’ own Franchise Creative Director Frank O’Connor and Franchise Producer Tyler Jeffers." "This action-packed anthology is essential reading for all Halo fans! 343 Industries and Dark Horse have also produced two blockbuster comics series with canonical story lines written by writers from the video game franchise (Halo: Initiation and Halo: Escalation) and will rerelease the graphic novel Halo: Fall of Reach in March. Halo: Tales from Slipspace is in stores October 12, 2016." And, of course, at your local comic book store, where it should appear in the August-for-October issue of Previews. Find your local comic shop here! Star Trek: Prey trilogy titles, release dates announced! I am delighted to announce the titles and descriptions for Star Trek: Prey, my trilogy releasing in this fiftieth anniversary year of Star Trek from Pocket Books! Star Trek: Prey - Book One: Hell's Heart releases September 27. Preorder it here! 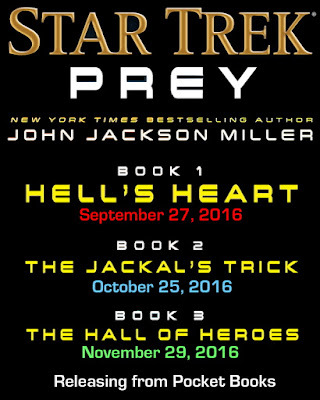 Star Trek: Prey - Book Two: The Jackal's Trick releases October 25. Preorder it here! 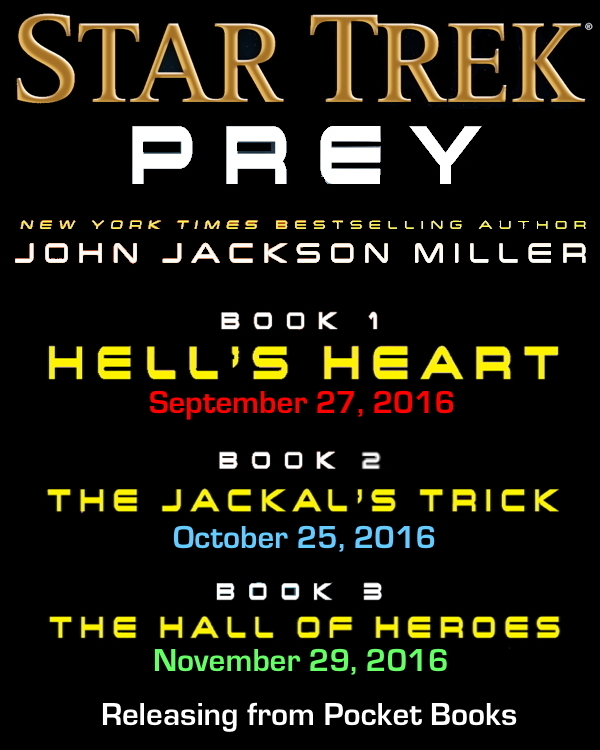 And Star Trek: Prey - Book Three: The Hall of Heroes releases November 29. Preorder it here! "Continuing the milestone 50th anniversary celebration of Star Trek—an epic new trilogy that stretches from the events of The Original Series movie The Search for Spock to The Next Generation! "When Klingon commander Kruge died in combat against James T. Kirk on the Genesis planet back in 2285, he left behind a powerful house in disarray—and a series of ticking time bombs: the Phantom Wing, a secret squadron of advanced Birds-of-Prey; a cabal of loyal officers intent on securing his heritage; and young Korgh, his thwarted would-be heir, willing to wait a Klingon lifetime to enact his vengeance. "Now, one hundred years later, while on a diplomatic mission for the United Federation of Planets, Captain Jean-Luc Picard and the crew of the USS Enterprise are snared in the aged Korgh’s trap—and thrust directly in the middle of an ancient conflict. But as Commander Worf soon learns, Korgh may be after far bigger game than anyone imagines, confronting the Federation-Klingon alliance with a crisis unlike any it has ever seen!" "Continuing the milestone 50th anniversary celebration of Star Trek—an epic new trilogy that stretches from the events of The Original Series movie The Search for Spock to The Next Generation!" This has been my major project for the last year and a half and I am delighted to see it coming to fruition. It'll be a book a month next fall — a fun adventure for all. Covers coming soon!